As you’re throwing together your menu for a wicked Halloween party, don’t forget the Sangrita. We’re not talking about the wine and fruit drink. No, Sangrita is a traditional Mexican drink served with high-end tequilas. Unfortunately, it is not as widely known in the United States. It does not contain alcohol, but rather it is a simple mix of juices and spices that is meant to accompany your tequila. You alternate sips and neither should be “shot” in one gulp. It’s a perfect drink when you are planning to spend some time with good friends (meaning, not planning to drive anywhere). You’ll want to have good quality tequila, such as Don Julio Reposado. Sangrita recipes vary. Don’t worry, it’s all good. Today you’ll find sangrita recipes heavy on tomato juice, while old-school recipes omit tomato altogether and focus on the flavors of orange and lime juices. You will also uncover creations that include Clamato, grapefruit, grenadine, sugar, cucumber, and even small, cut-up vegetables. Our contributing writer Norma Vega found this one original and “authentic” recipe for Sangrita, from the Lake Chapala area in Jalisco, where it apparently originated. Make a pitcher full of the sweet and spicy Sangrita to keep the tequila flowing and your guests happy. Before you know, you’ll need to pull out another bottle of tequila and start dancing to the Monster Mash. To make the cucumber shot glasses, halve one whole cucumber. Cut the half to the size of shot glass you want. With a vegetable peeler, remove 2/3 of the skin off the cucumber. Leave a little skin at the bottom. 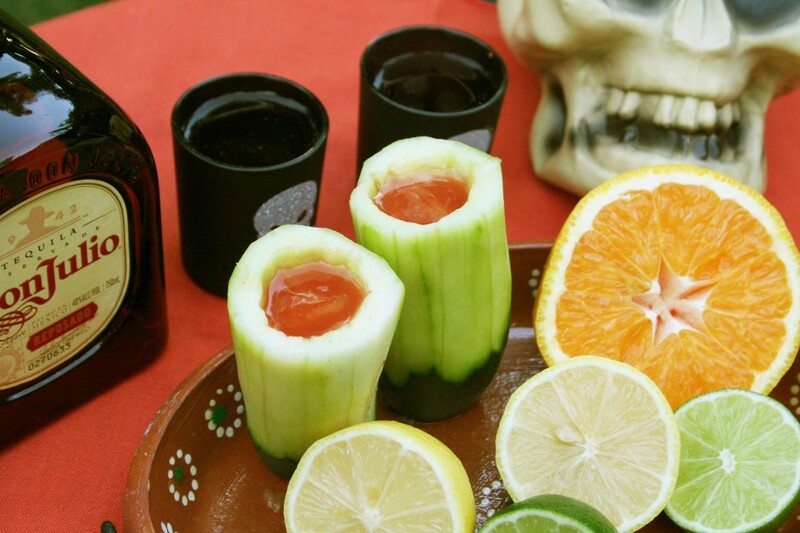 Use a 1/4 teaspoon melon baller to scoop out the middle of the cucumber, forming a small shot glass.